Come see your next car in person at Ottawa’s used car dealership Canadian Auto Mall! Our street address is 6 Cedarow Court, Stittsville, ON K2S-1V6. 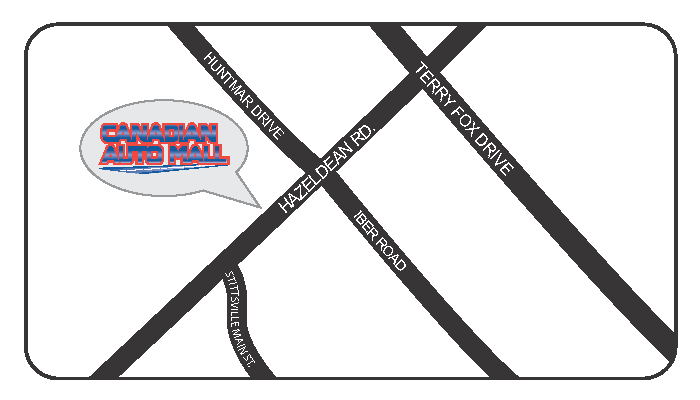 We’re located at the corner of Hazeldean Road and Cedarow Court. To make it easy for you to find us, below you’ll find directions to our showroom from different locations around Ottawa. From Downtown Ottawa, take 417 West, exit at Terry Fox Drive. Turn left (south) onto Terry Fox Drive, drive 2 km, then turn right (west) on Hazeldean Road. Drive for 1.5 km, Canadian Auto Mall is on the right, just after Huntmar Drive and across from Cabotto’s Restaurant. From Arnprior, take 417 East, exit at Carp Road. Turn right (south) on Carp Road, drive 2 km, then turn left (east) on Hazeldean Road. Drive 1.5 km, Canadian Auto Mall is on the left, just past Sweetnam Drive and across from Cabotto’s Restaurant. From Kemptville, take 416 North to 417 West, exit at Terry Fox Drive. Turn left (south) onto Terry Fox Drive. Drive 2 km, then turn right (west) on Hazeldean Road. Drive for 1.5 km, Canadian Auto Mall is on the right, just after Huntmar Drive and across from Cabotto’s Restaurant. If travelling by bus, take the 96 from Downtown Ottawa to bus stop # 5711, (Hazeldean/Fringewood). We are 100 meters west on Hazeldean Road.